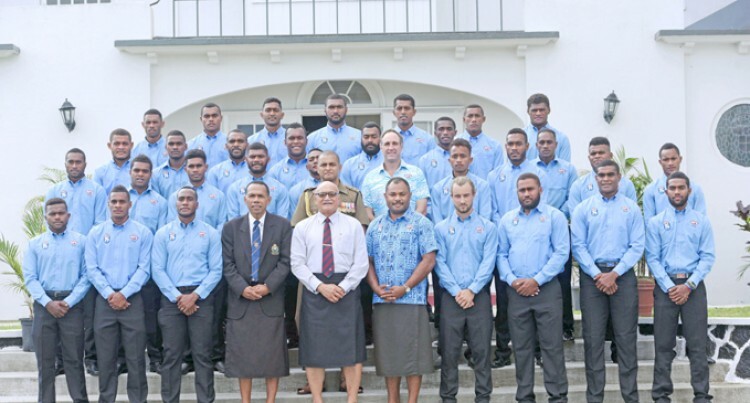 The AFL Fiji Tribe men’s team and Fiji Vonu women’s team presented their i-tatau to the President, Major-General (Ret’d) Jioji Konrote at Borron House, Suva yesterday. The President reminded them that although Fiji does not have the resources that most countries do to develop the sport, the confidence and sporting spirit is still there regardless. “I’m really honoured to be the first president and head of state to receive the first i-tatau from Fiji’s national athletes in this unique sport,” he said. “With Fiji being a sport loving nation, it’s most encouraging that you have established a sport in the country because this will give more Fijians the opportunity to try out another exciting sport. Fiji may not have the luxury or resources like the more developed countries have but we certainly possess a good sporting spirit. “I have every confidence that you will have a successful outing in Australian. I know that you will proudly showcase the Fijian spirit and improve on your performance and your rankings in both the men and women’s team. The nation is confident that you have done the hard yards in training and it is now time to perform to the best of your ability. Known as a minor sport in the country, AFL Fiji’s first corporate support and presentation of their i-tatau to the President has reaffirmed AFL that they mean business. AFL men’s coach and development officer Simon Highfield said what the boys and girls do in Australia will lift the profile of the sport. “The boys and girls will be performing fantastically on and off the field, they have prepared well and done everything that the coaches have asked them to do,” Highfield said. “Getting the support from BSP Bank and then presenting our i-tatau has re-established us as a real sport in Fiji and it shows the country that we do mean business here. Once we go to Australia, our performance on the field for both the men and women will really reiterate that and I have no doubt that the sport has a really bright future in Fiji and we got the boys and girls to prove it now. “Taking part in such a competition means a lot for the boys and girls, it is massive, and they play this because they love the sport and because they can represent their country. They have paid thousands of dollars in levies to make sure they go to Australia, they train very hard since the start of the year and this may be the only opportunity for them to get out of the country. Highfield also said overseas contracts for the players could be a possibility in the future. The team will leave on Wednesday next week for Australia.